Some bands just know how to have a good time on stage. They smile and laugh as they play their songs with passion and ease. They interact with the crowd, but, not excessively. “That would make listeners feel uncomfortable,” said my girlfriend Rebecca, who accompanied me to the show last night. Oh, and lest we not forget, some bands are composed of fantastic musicians who create compositions that can brighten a crowd and keep them in a state of euphoric joint singing for a solid two hours. Last night, I went up to Ithaca and saw one of those bands. And, if there was one pervasive comment that was shared among those who attended the concert, it was most certainly one consistent with the conversation I had with my brother and his friends driving back to my brother’s Cornell dormitory after the show. Guster is awesome! The State Theater is an intimate venue that served originally as a movie palace. Gothic and Renaissance architecture inspires the lavish interior adorned with medieval crests and a ceiling of constellations. It is somewhat dreamy, mystical even. It also provides solid acoustics. It was my first time at this venue. Our group ended up sitting in the balcony. There really isn’t a bad seat in the house. The stage is spacious and the members of Guster took advantage of the room, moving around freely while they played their hits. The perennial college band that is Guster plays music that infuses a mix of fast-paced folk/pop with some unconventional inspirations, including a bongo set manned by the awesomely talented “Thundergod” Brian Rosenworcel. Guster can just as easily hit you with a wall of sound and make you want to get out of your seat and hop around, than it can sit you down with a slow bridge or song opening. The harmonies that Adam Gardner and Ryan Miller employ are fantastic. Here is the best way I can describe Guster. In any college you will run into several bands trying to do what Guster has done. But, creative, diverse, harmony-focused music is not as easy as Guster makes it seem on stage. So, these bands fizzle out and the lead singer/songwriter becomes a worried graduating senior (wait, are we still talking about Guster). Anyway, Guster never vanished. They are the constant in a countless field of evanescent college bands. Guster, though, has certainly transcended college. Most of their original fan base has probably settled down with kids. Guster certainly still attracts mostly college listeners, but, people do grow up and continue listening to music. 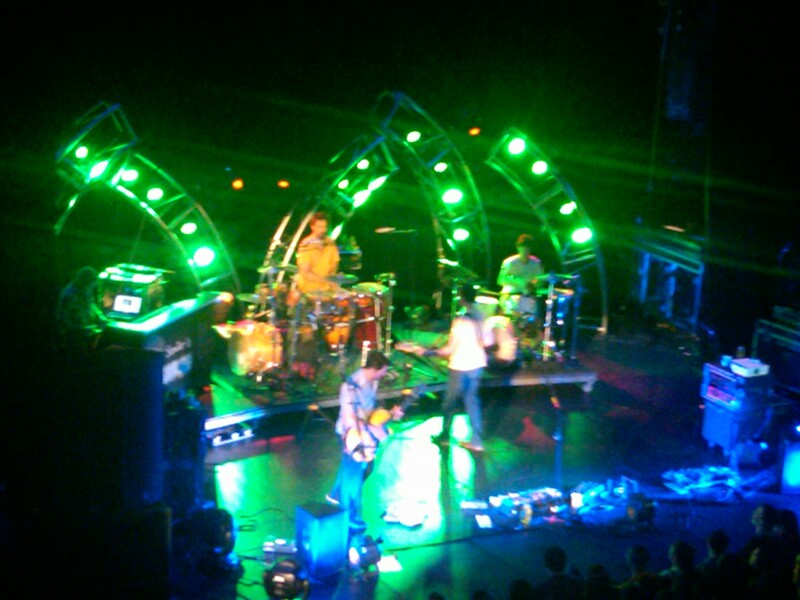 Since they started in the early 90’s, the members of Guster have matured musically and this was evident yesterday night. Picture I took at the Guster Concert Last Night. How about we get to the concert. First, the opening act was awesome. I will be doing a profile on them in the upcoming future…so, as to not spoil it, I will not be talking about the opening act. Guster opened up with the lyrics, “woke up today.” Crafty, Guster. 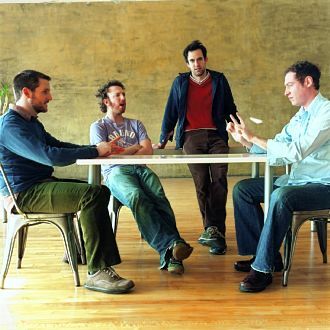 “What You Wish For,” the classic Guster hit was followed by track four on the newly released album Easy Wonderful. “This Could All Be Yours,” is possibly the best song on the new album. Here, listen to it below. The song is like new classic Guster. The bongos come back and we get harmony and elongated stretches of melodic noise. The lyrics are upbeat and the message is perfect. Keep making music like this Guster. The song is clean and mature. But, the rhythm is Guster of 8-10 years ago. It just works. 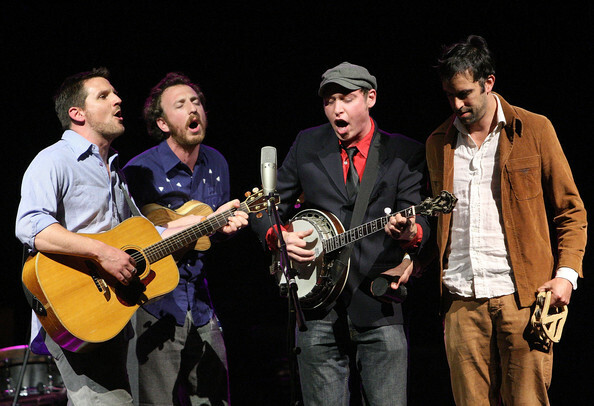 The concert continued with a few Guster favorites with a song off their new album mixed in. The crowds reaction when the opening chord and keyboard riff for “Satellite” was struck was just awesome. You could tell Ryan was having an awesome time (even though he and Adam were struck with a virus that they stated would hamper their performance, asking for crowd help singing on many songs. A clever ploy to get people singing your songs, I see. Seriously though, by the end of the show they looked exhausted. Well, Ryan did jump into the crowd during the encore. Well, I am getting ahead of myself aren’t I). The song was followed by “One Man Wrecking Machine,” the chorus of which is fantastically catchy. It was aided by the entire theater singing it right back at the band. I was impressed with how many people in the audience knew every word of every song. The rest of the set included a variety of old and new material. Guster did play “Demons” and “Barrel of a Gun,” easily the two biggest fan favorites of the show. I was most impressed by the performance of “Either Way,” which Ryan prefaced with a choice. “I’m going to give you a choice on the next song, but I already know what you are going to pick,” he said. It was between the popular “Either Way” and “Ruby Falls,” good song, not as good as “Either Way.” The latter would have probably been easier on his strained vocal chords, affected by his virus, but, the crowd picked “Either Way” and Ryan sang the song excellently, holding out the falsetto with ease. Excellent show. They play their hearts out every time they go on stage and fans really do appreciate it. It’s exciting to see a band like Guster. Rarely do you experience a great band that is having just as much fun as the crowd is having. That is the charm of Guster.